The Butcher's Daughter: Calling All Food Snobs and Instagrammers! • Tips, Trends & News in 60 Seconds or Less! 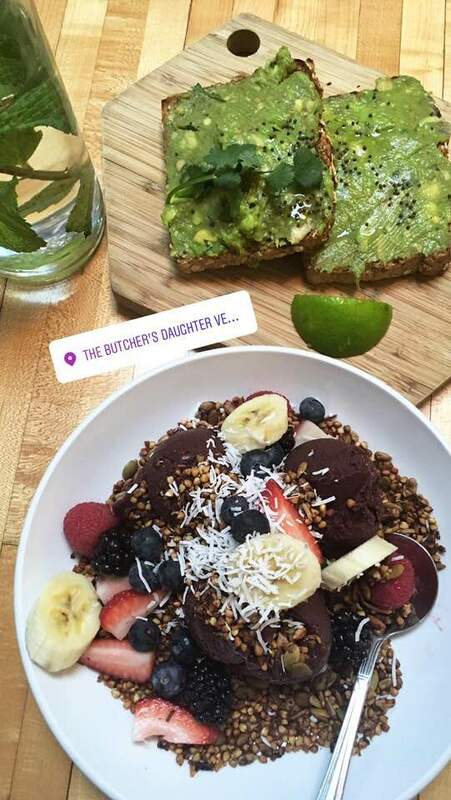 The Butcher’s Daughter: Calling All Food Snobs and Instagrammers! The Butcher’s Daughter is conveniently located on Venice’s trendiest street, Abbott Kinney. This hip new vegetarian and vegan eatery is the perfect place to refuel if you find yourself wandering this artsy, eclectic street. The space is bright, open and full of lights, hanging plants and succulents. The Butcher’s Daughter screams clean, modern and aesthetic. When I ate here, I stuck to the classics- acai and avocado toast. The acai was a clear winner with the homemade granola and beautiful presentation and the toast was delicious (not the best avo toast this millennial has consumed, but still very good). I certainly will be back to try their dinner menu soon! This intimate and cozy space definitely gets absolutely packed on the weekends, but I went on a weekday afternoon and got a table and parallel parking spot right away. Do not, however, let these mere inconveniences stop you from dining at this quintessential LA spot — your Instagram fans would be let down and you would live with the regret of not experience this farm to table culinary masterpiece. Hey, sometimes it pays off to be basic!